Vibrant colors, elaborate jewelry and dramatic make-up are three things you will almost always find on a traditional Indian bride. 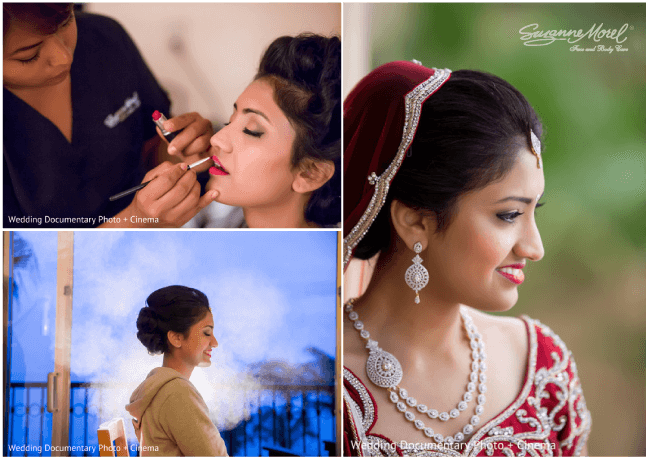 Suzanne Morel Face and Body Care has styled many Indian brides in the past, and we love the fact that there is usually a different bridal look for each wedding event! 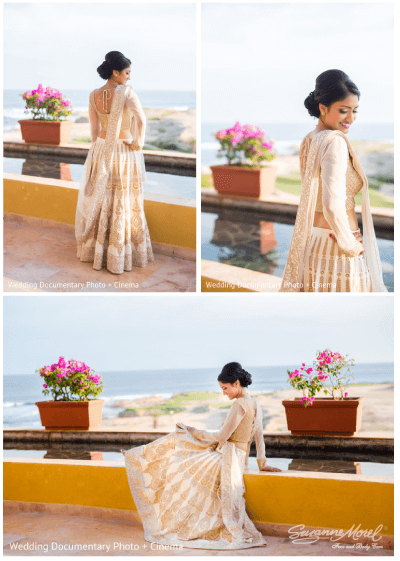 Lovely Indian bride Rupa (and her groom Sirish) hosted four days of destination wedding events here in Los Cabos, and we were so honored to be a part of their vendor team! In true Indian style, this couple kept their guests entertained with four days of festivities to celebrate their union as husband and wife. 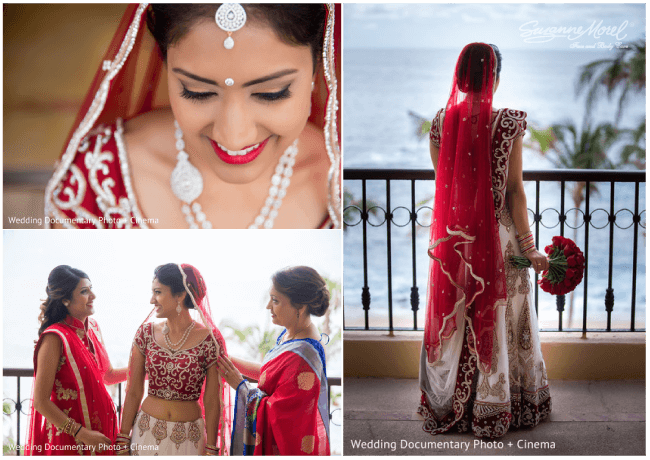 It was truly our pleasure to help sweet Rupa look and feel her most beautiful during this special time, and we’re thrilled to have so many gorgeous photos of her Indian bridal looks to share with you! Striking eye make-up is a major part of the Indian bridal style. For Rupa’s eye make-up, we kept her brows and lashes well defined, but never harsh. Instead, we gave this blushing bride a dramatic lip to show off her dazzling smile! 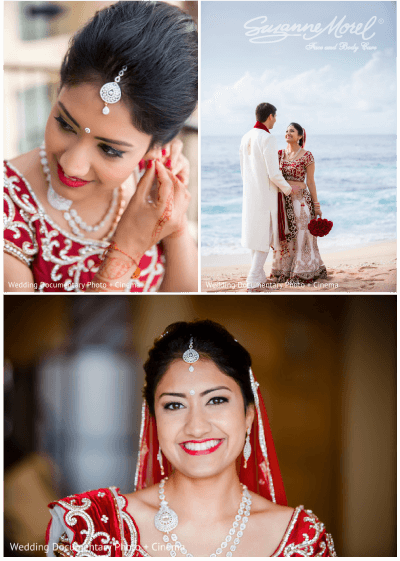 Rupa wore her hair in a classic up-do for each of her bridal looks—the perfect choice to show off her bridal jewelry and intricate clothing. Suzanne Morel Face and Body Care offers the most experienced bridal hair and make-up team for destination brides in Los Cabos. Contact us today for your complimentary bridal consultation! This entry was posted in Cabo Bridal Hair and Makeup and tagged Cabo bridal salon, Cabo Indian bridal makeup, Cabo Indian bride, Cabo Indian wedding, Cabo wedding salon, destination Indian wedding Mexico, Indian bridal looks, Indian bridal style, Indian destination wedding, Maharani bride Cabo, modern Indian bride, traditional Indian bridal hair, traditional Indian bridal makeup.